Recognized for its calming and relaxing properties, the Finessence Extreme Organic Red Mandarin Essential Oil acts naturally on the nervous system for an immediate state of relaxation. It eases falling asleep and helps you to have a restful sleep. This organic essential oil is ideal for fighting insomnia, nervous tension and stress. As a cosmetic active ingredient diluted in a biological vegetable oil, it is generally used for a relaxing massage and locally for the prevention of orange peel. Its purifying action acts effectively on acne pimples, ideal for skin with imperfections. It exudes a sweet floral scent with a delicate green note reminiscent of lime zest. Sleep disorders, nervous agitation? 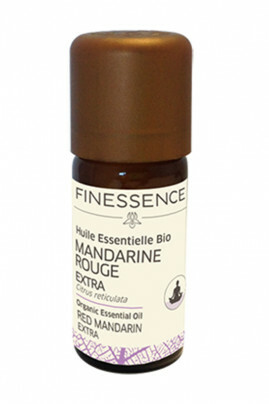 Adopt Finessence Extreme Organic Red Mandarin Essential Oil ! In atmospheric diffusion : Create a floral atmosphere by adding a few drops of essential oil of red mandarin in your diffuser. For dosage and diffusion time, follow the instructions for your device. In cutaneous application : In a spoon of organic vegetable oil, pour 4 drops of essential oil and massage delicately on the area concerned. The massage is preferred on the solar plexus, the stomach, the lower abdomen or the lumbar according to the problems. In infusion : 3 to 4 drops of essential oil on a piece of sugar or in honey which you then add in a liter of lukewarm water. A 100% Organic Essential Oil for a restful sleep ! Citrus reticulata peel oil, linalool*, limonene*, citral*, geraniol*, citronellol*. Flammable liquid and vapour. Causes skin irritation. May cause an allergic skin reaction. May be fatal if swallowed and enters airways. Very toxic to aquatic life with long-lasting effects.